If you suspect you have an infection in your skin, you need prompt medical treatment to determine if the redness and pain are the result of cellulitis. 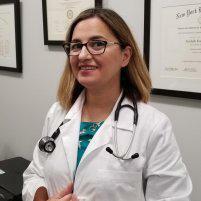 At Advanced Infectious Disease Medical in Hoboken, New Jersey, Avisheh Forouzesh, MD, is experienced in diagnosing and treating cellulitis, including MRSA. She offers comprehensive treatment plans — including antibiotics — to clear the infection and improve the overall health of your skin. Don’t ignore the signs of cellulitis — schedule an evaluation online or by calling the office directly. Cellulitis is a potentially serious skin infection resulting from the entrance of bacteria through cuts or wounds on your skin, or as a result of an animal bite. Group A streptococci and Staphylococcus are the most common of these bacteria which are part of the normal flora of the skin and normally do not cause actual infection while on the outer surface of the skin. Cellulitis typically affects the skin on your lower legs, but it can also develop on your arms, face, and other areas of your body. When not properly treated, cellulitis can develop into a life-threatening infection that can spread to the bloodstream and lymph nodes. Red spots or blisters may also develop in the affected area. What are my risks for developing cellulitis? There are certain factors that may increase your risk of developing this type of skin infection. If you already have existing skin problems — such as eczema — you may be more likely to develop cellulitis. If cellulitis is part of your medical history, you may be more susceptible to developing it again in the future. Dr. Forouzesh can diagnose cellulitis after reviewing your symptoms and performing a physical exam. What treatment options are available for cellulitis? Typically, Dr. Forouzesh prescribes an antibiotic to clear the infection. Depending on the size and depth of the infection, Dr. Forouzesh will determine if you need oral or intravenous antibiotics. She will recommend close follow-ups to be sure the infection has cleared and to prevent future skin infections or cellulitis. To prevent a skin infection, it’s important that you tend to cuts or open wounds as soon as they happen. Wash the area with soap and water, and cover the area with gauze if there is an open wound. If you have an underlying medical condition like diabetes that increases your risk for cellulitis, you should routinely check your skin for signs of infection. Use a high-quality moisturizer to prevent cracking in your skin. If you notice any sign of infection, schedule a visit with Dr. Forouzesh as soon as possible for an evaluation. Learn more about treating and preventing cellulitis, schedule an appointment online or by calling the Hoboken office directly.